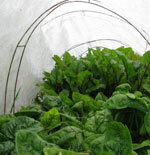 A bed of spinach and beets, still thriving in late October under the cozy warmth of Garden Quilt. Here at Gardener’s Supply, we’ve been singing the praises of season extending fabrics since our very first catalog way back in the early 1980s. There’s no easier way to shield plants from frost, hail, wind and too much sun, as well as many sorts of insect damage. This fall we ran several blog posts and how-to articles about using season extending fabrics, and for 2010, we’ve also expanded our selection of season-extending products (Shade Netting is back!). But the fact remains that most gardeners are still not taking advantage of this super-effective, low-tech gardening solution. Maybe the White House and USDA will be more successful in spreading the word. In this short video, Sam Kass, assistant chef and garden coordinator for the White House, and Kathleen Merrigan, USDA Deputy Secretary extol the benefits of garden fabrics, as their workmates put it to use covering some of the beds in the White House vegetable garden. Harris Sherman, USDA Under Secretary for Natural Resources and Environment also makes a brief appearance to talk about a new program for farmers that’s encouraging the wider use of these fabrics by helping to offset costs. He encourages interested farmers to contact their local NRCS office to sign up. Don’t be left out in the cold this spring. Discover what savvy gardeners like Eliot Coleman have known for years: garden fabrics keep plants happier and healthier and will make your vegetable garden more productive.